Midrash Proverbs (Hebrew: מדרש משלי) is the haggadic midrash to the Book of Proverbs, first mentioned under the title "Midrash Mishle" by R. Hananeel b. Ḥushiel (first half of the 11th century) as quoted in the Mordekai on B.M. iii. 293. Nathan of Rome calls this midrash "Agadat Mishle" (Aruk, s.v. ). It was, besides, called erroneously "Shocher Tov" (ed. Zolkiev, 1800; Benjacob, Oẓar ha-Sefarim, p. 302, Nos. 449-451), a name by which Midrash Tehillim is known. The midrash has not been preserved entire; for there are no comments whatever on several chapters, e.g., on iii., vii., and xviii., and others have been annotated only in part. The editor of the Yalḳuṭ used some portions of this midrash which are now missing, although it may be assumed that not all the sentences which he included in his work with the statement that they were taken from this midrash were really a part of the Midrash Mishle which he had at hand (comp. S. Buber, Midrash Mishle, Introduction, p. 5b). 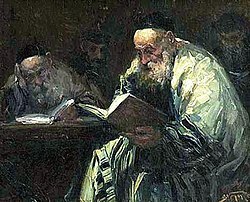 This midrash is different from all the other haggadic midrashim in that its interpretations approach the simple exegesis then in vogue, being brief and free from the prolixity found in the other midrashim, so that this work is in the form of a commentary rather than in that of a midrash. The interpretations follow immediately upon the words of the text, without the introductory formulas found in the other midrashim, "as Scripture says," or "Rabbi N. N. began"; the latter formula, however, occurs at the beginning of the midrash. The editor of the midrash drew upon the Mishnah, Tosefta, Mekilta, Sifre, Pesiḳta de-Rab Kahana, Abot de-Rabbi Natan, Bereshit Rabbah, Wayiḳra Rabbah, Ecclesiastes Rabbah, Canticles Rabbah, and the Babylonian Talmud. But he does not seem to have known anything about the Jerusalem Talmud, since he does not quote from it. The editor was therefore probably a Babylonian Jew, although this can not be definitely decided. The exact time at which the editor lived can not be determined. Zunz holds (G. V. p. 268) that the midrash was compiled in the middle of the 11th century; but this is dubious inasmuch as it is mentioned by name by Hananeel and Nathan, both of whom lived in the first half of that century. Buber thinks that the midrash was compiled as early as the 8th century, since quotations from it are found, though not with references to the source, at the end of the Halakot Gedolot and in the Seder R. Amram 12b. Although the midrash contains comparatively few legends, myths, or parables, it has many interesting sentences for which no parallel exists in the other midrashim. For instance, the four riddles which the Queen of Sheba propounded to King Solomon (Buber, l.c., p. 20b) are found in no other extant midrash, but they correspond to the first four of the nineteen riddles mentioned in the manuscript Midrash ha-Ḥefez (comp. S. Schechter in Folk-Lore, 1890, p. 353). Aside from the manuscripts mentioned by S. Buber (pp. 14b-15a), there is one of the Midrash Mishle in the library of the Jewish Theological Seminary of America (p. 5, 1018, fols. 25a-48b). This manuscript, which includes only chapters i. to xvi., corresponds in many passages with the Constantinople edition. In xiv. 34 (ed. Buber, p. 39b) it has "Meṭaṭron" instead of "Michael," as in the printed editions. If this reading is the original one, it would confirm the assumption that the editor was a Babylonian, since the name "Meṭaṭron" occurs only a few times in the sources from Israel, the name "Michael" being found instead (e.g., Targ. Yer. on Ex. xxiv. 1 has "Michael," while Sanh. 38b has "Meṭaṭron"). The first edition was issued at Constantinople without date; the second, at Venice in 1547. Apart from these two, eight other editions have been issued (comp. Buber, Introduction, p. 16a). The latest and best edition in 1900 was that by Buber (Wilna, 1893), with an introduction and notes. The Midrash Mishle has been translated into German by August Wünsche (Leipsic, 1885). August Wünsche, introduction to his translation of the Midrash Mishle. This article incorporates text from a publication now in the public domain: Singer, Isidore; et al., eds. (1901–1906). "Proverbs, Midrash to". The Jewish Encyclopedia. New York: Funk & Wagnalls. This page was last edited on 2 July 2015, at 06:28 (UTC).